We provide our take on ten key elements to a great compensation process. 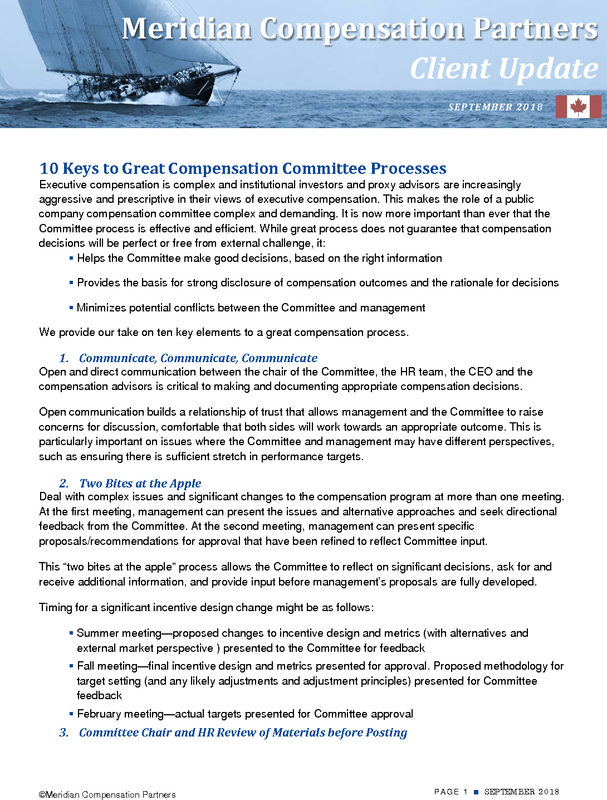 Open and direct communication between the chair of the Committee, the HR team, the CEO and the compensation advisors is critical to making and documenting appropriate compensation decisions. Open communication builds a relationship of trust that allows management and the Committee to raise concerns for discussion, comfortable that both sides will work towards an appropriate outcome. This is particularly important on issues where the Committee and management may have different perspectives, such as ensuring there is sufficient stretch in performance targets. Deal with complex issues and significant changes to the compensation program at more than one meeting. At the first meeting, management can present the issues and alternative approaches and seek directional feedback from the Committee. At the second meeting, management can present specific proposals/recommendations for approval that have been refined to reflect Committee input. This “two bites at the apple” process allows the Committee to reflect on significant decisions, ask for and receive additional information, and provide input before management’s proposals are fully developed. Sharing materials with the Committee Chair, the HR team and the Committee advisor, before materials are posted is a critical practice. This usually starts with an exchange of written materials with management providing their materials to the advisor and the advisor providing its materials to management. This is ideally followed by a conference call to review and discuss the materials. Areas of potential difference of view are discussed, factual issues resolved, changes made, alternative approaches considered, materials enhanced and areas of real difference of view narrowed. This saves Committee time, and ensures that the Committee focuses its time on substantive concerns. It also allows the Committee Chair to socialize sensitive issues with other members of the Committee (or Board) in advance, if needed. Understand but don’t be a slave to market norms and proxy advisor expectations. While it is critical to consider competitive practice, first and foremost, companies should do what is right for their business, its strategy and its current challenges and strengths. Understanding market norms and proxy advisor expectations allows the company to understand when it is doing something unusual. Focus should be on doing this for strong business reasons and making clear disclosure of the business rationale for any decisions, especially those that are likely to draw adverse attention. Best practice is to start and end each meeting with an in camera, private or executive session. The private session at the start of the Committee meeting is often used by the Committee Chair to tee up the key agenda items, identify critical issues and get an advance sense of Committee members’ views. The in camera session at the end of the meeting allows the Committee to have a final discussion and raise any issues that are more comfortably raised without management present including CEO performance assessment and compensation decisions. Whether or not there is anything of substance to discuss, the Committee should follow a consistent process of having in camera meetings. This avoids the awkwardness of a Committee member having to suggest that a private session is required, which telegraphs concern. It also allows for the good disclosure and legal record that an in camera session is held at each Committee meeting. Start with an annual calendar that follows the meeting and public disclosure cadence. 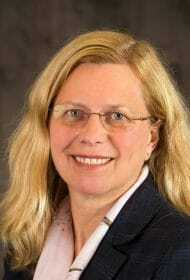 Fourth and first quarter meetings have a very heavy agenda with items that are critical to the annual reporting cycle. Accordingly, it makes sense to use the “off-cycle” meetings for significant discussions relating to incentive design, assessment of pay and performance, succession planning and talent development, etc. Using a 12-month rolling calendar can make sure that these critical, but less time sensitive issues are addressed in a thoughtful manner. In addition to the 12-month rolling calendar, it is a helpful practice to include the agenda for the upcoming meeting, with the materials for each meeting. It is not always possible to make decisions that meet the multiple and sometimes conflicting requirements of shareholders, proxy advisors, executives and business strategy. When a Committee makes a decision to do something that may be controversial—a special retention award, an adjustment to performance targets, etc., it is a good practice to prepare a draft of the disclosure that could be made of the decision. This helps management and the Committee to understand whether there is a clear, compelling and discloseable rationale for decisions that are outside the mainstream and if any immediate disclosures are required. Special retention awards and unusual forms of compensation (such as long-term performance cash, which is disclosed when it is paid out, rather than when it awarded) can create anomalies in executive compensation which can make an executive a named executive officer (NEO) for a single year. This may be unavoidable. However, when making decisions about unusual awards, part of the information that should be provided to the Committee is an analysis of how the award will potentially affect who the NEOs are. Many directors sit on multiple boards. Even for directors who sit on a single board, compensation programs are sufficiently complex that a compensation dashboard can be helpful. The dashboard summarizes the compensation of the NEOs, the compensation peer group, annual incentive plan measures and weightings and long-term incentive vehicles and mix and performance measures. The dashboard is part of the materials for each meeting, often in the appendix, and provides the critical context for decision making easily at hand.